BEIRUT (AP) — Most Syrians displaced by recent fighting stranded at the border with Jordan in the country’s south have returned to their homes, a U.N. official and a group that closely monitors the Syrian war said Sunday. 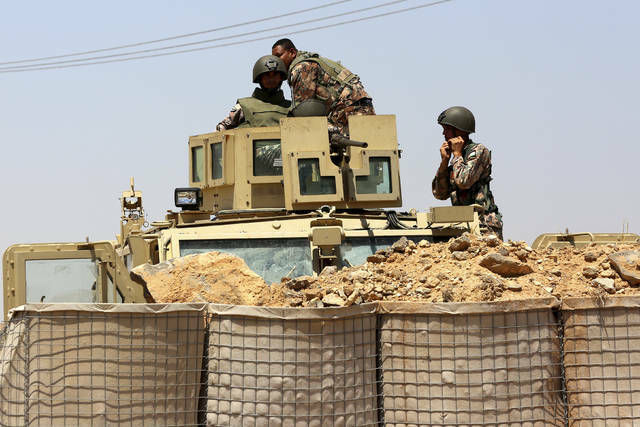 The return to areas now controlled by the government came two days after Syrian troops regained control of the Naseeb border crossing with Jordan, along with a long stretch of the border between the two countries. 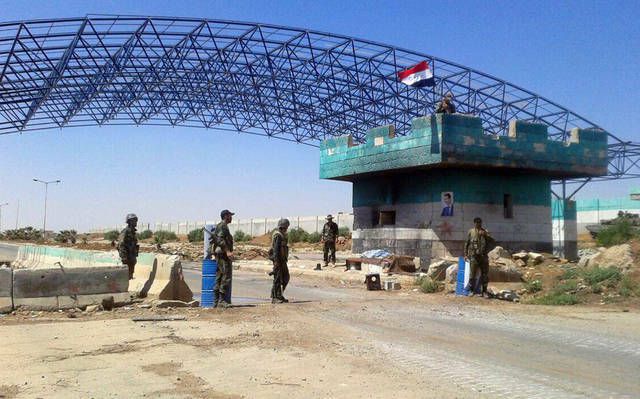 On Saturday Syrian troops hoisted national flags at the border crossing point three years after losing it to rebels. 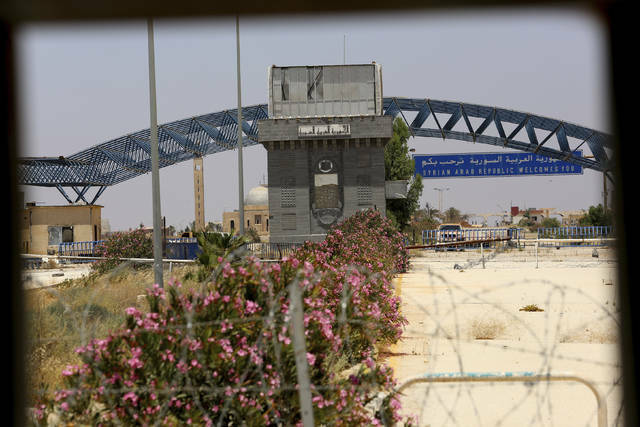 Syria’s government offensive to retake the province of Daraa from insurgents, which began on June 19, has displaced some 330,000 people, many of them heading to the border with Jordan that refused to allow refugees to cross. The fighting in the border area stopped on Friday under a Russian-mediated surrender deal. But the situation “remains very difficult and it’s of a huge concern to us,” Pedersen told reporters, repeating calls for a cessation of hostilities to allow humanitarian operations and eventually reaching a political settlement to the Syrian crisis. Syrian opposition activists reported intense shelling and airstrikes on the rebel-held village of Um al-Mayadeen, few kilometers (miles) north of the Naseeb border crossing. Hours later, state news agency SANA said troops captured Um al-Mayadeen after a battle with opposition fighters. Although the main rebel groups in the eastern parts of Daraa province have accepted to hand over their weapons as part of the Russian-mediated deal, some have vowed to continue fighting, mostly in western parts of Daraa and the nearby Quneitra region on the front with the Israeli-occupied Golan Heights. Pedersen said the U.N. organizations need to respond to the populations in southwest Syria, especially the displaced returning home from the Jordanian border and from near the Golan Heights, where they have fled airstrikes and shelling in the past weeks. “Our biggest concern right now and our biggest ask is to allow us to move in… to reach the populations that we know are in greatest need,” Andersen said. The Britain-based Syrian Observatory for Human Rights said some 60,000 Syrians have returned to their homes, while thousands of others fled to another area, fearing detention by government forces or being drafted to the military. Akram reported from Aman, Jordan. Park Smart for Red, White & Boom! Columbus, OH (June 28, 2018) – On Tuesday, July 3rd, over 400,000 people will gather in downtown Columbus for the largest single-day event in the city: “Red, White & Boom!” With that many people heading downtown, BBB wants attendees to have fun, be safe and not worry about parking issues. The official “Red White & Boom!” website has information on guaranteed reserved parking, public parking areas around the city and tips for COTA bus riders. Any consumers planning on attending the event should do their research and plan out their parking prior to their arrival to avoid any issues or stress. Know the Ohio Revised Code Section 4531.601 for private tow-away zones. It might be handy to keep a copy in your car’s glove box so that you can refer to the maximum amount allowed for towing fees and other towing restrictions. Do not park illegally, even for a short amount of time. If you think you may be parking illegally, it is best to move elsewhere. Walking an extra block will be worth the potential towing fees. Park in a lot where you know your vehicle will be safe instead of parking on a side street or on private property. Private lots will have signs that you can carefully read stating their parking rules. Even if you do not see a tow truck, someone could see you. Tow truck companies often pay “spotters” to watch the lot and call if they see a car owner leave their vehicle in the lot. Be sure your tags are up to date! Do not let your license plates expire. If you have a dispute with a towing company on private property, the police cannot help you. If you are on public property, such as a city street, then the police may be able to help you if you believe that the towing company is violating the law. To find out more about “Red White & Boom!” visit https://redwhiteandboom.org/. (COLUMBUS, Ohio) Columbus State Community College announced today that it has raised more than $5 million in private philanthropy toward a $10 million fundraising goal for Mitchell Hall, the College’s planned 2019 new Hospitality Management and Culinary Arts building. Columbus Mayor Andrew J. Ginther, Cameron Mitchell Restaurants (CMR) CEO and founder Cameron Mitchell and CMR President David Miller joined Columbus State President David Harrison in celebration of the fundraising milestone at a groundbreaking event at the 250 Cleveland Avenue construction site. · Doubling Hospitality and Culinary Arts enrollment capacity to more than 1,500 students. · A professionally managed, student-staffed 50-seat sit-down restaurant and bar and 20-person retail café and bakery, both with outdoor seating. · A 400-plus seat banquet-capacity conference center with onsite catering and a sweeping balcony overlooking downtown. · Onsite farm-to-table food production gardens. · A 100-seat culinary theater. Completion is scheduled in autumn 2019. Project architect is DesignGroup. Gilbane is construction manager. In addition to $10 million in private philanthropy, the $33 million Mitchell Hall project will be funded by $10 million in state capital funding, and project financing secured by the College. The City of Columbus has also designated more than $7 million on aligned streetscape, utilities and parking improvements in support of the project and surrounding neighborhood. As part of the project, Columbus State has committed to a partnership with Mid-Ohio Foodbank to jointly develop innovative solutions to address food insecurity on campus. The College also intends to operate the commercial components of the building, which include a restaurant, café and conference center, as a social enterprise reinvesting proceeds into community needs. Columbus State and YMCA of Central Ohio are also collaborating to health and wellness solutions for both students and neighboring community residents. Seventeen Central Ohio high school students will realize a month’s worth of project development and planning on Friday. That’s when they’ll present items they designed and created with 3D printing technology at a summer camp created by Columbus State Community College and the PAST Foundation. In its first year, the Additive Manufacturing Summer Institute focuses on manufacturing career preparation through hands-on experience with 3D printing, in which objects are created by adding layer-upon-layer of material, whether the material is plastic, metal, ceramic or concrete. Underwater “paper” for use by underwater archeologists. Students will be practicing project demonstrations for their final presentations from 11 a.m.-noon on Friday, June 29 at the PAST Foundation, 1003 Kinnear Rd, Columbus, Ohio. Their official presentations will be held later that day. The Additive Manufacturing Summer Institute has been made possible by an $815,000 National Science Foundation (NSF) Advanced Technology Education (ATE) grant awarded to Columbus State and the PAST Foundation. The money pays a stipend to the instructors who gain professional development experience, and provides full tuition for the students. The funding will allow the Institute to be repeated for at least two more summers. In addition to the PAST Foundation, partners in the project include the Ohio Manufacturing Institute at The Ohio State University, Metro Early College High School, Tolles Career and Technical Center, Battelle Memorial Labs, EWI, and other industry partners. Westerville, OH—Otterbein University has successfully exceeded its $50 million comprehensive campaign goal, launched by President Emerita Kathy Krendl, who retired on June 30, 2018. More than 4,000 donors made their first gifts to Otterbein in support of the campaign. An impressive 138 new funds were created to support Otterbein students. Donors made gifts to celebrate everything from 50th wedding anniversaries to graduations. Many gifts were made in honor of loved ones. An impressive 60 percent of faculty and staff supported the campaign this fiscal year, a new record for Otterbein. Access and Affordability: Ensuring Otterbein’s excellence is an opportunity families can afford. Building a Model Community: Building a strong foundation of resources to foster innovation, creativity and learning and support the Otterbein’s hallmark Five Cardinal Experiences experiential learning program. Campus Renewal: Advancing Otterbein’s learning experience by enhancing facilities and green spaces. Gifts have supported everything from scholarships and research and travel funds to building renovations and a new track and turf at the university’s Memorial Stadium. The Point at Otterbein, a unique partnership with the City of Westerville which opened in fall 2016, has already made an impact not only for Otterbein students, but also the central Ohio community, as resident companies continue to add jobs at the facility. The Where We Stand Matters campaign was announced to the public at Homecoming on Sept. 20, 2014. It was the first comprehensive campaign that the institution has commenced in 20 years. The celebration of the campaign will be held at Homecoming on Sept. 22, 2018, where the total amount raised will be announced. The community is invited to attend the festivities. For more information, visit www.otterbein.edu/stand or see what people are saying with #STANDwithOtterbein. This historic $50 million campaign—the value, the people and purpose for which it stands—will position Otterbein to stand strong among the great institutions of our country. Your gifts to Otterbein University help us provide students with an excellent education. Otterbein University is a private university nationally recognized for its intentional blending of liberal arts and professional studies through its renowned Integrative Studies curriculum and its commitments to experiential learning and community engagement. Otterbein recently launched Kindness Matters, an initiative in partnership with Kind Columbus at The Columbus Foundation, in its effort to cultivate and inspire kindness throughout the greater Columbus region. Otterbein is a recipient of the 2015 Carnegie Community Service Classification; a finalist for the 2014 President’s Award for Economic Opportunity Community Service; and has been honored With Distinction by the President’s Higher Education Community Service Honor Roll since the list’s inception in 2006. It stands in its category’s top 15 percent in U.S. News & World Report’s guide to “America’s Best Colleges.” It also is recognized in national rankings by Forbes and The Wall Street Journal. Otterbein offers more than 70 undergraduate majors; six master’s programs; and a doctorate in nursing practice (DNP). Its picturesque campus is perfectly situated in Westerville, Ohio, America’s fifth friendliest town (Forbes), just minutes from Columbus, the 14th largest city in the country. Otterbein’s commitment to opportunity started with its founding in 1847 as one of the nation’s first universities to welcome women and persons of color to its community of teachers and learners, which now numbers 2,400 undergraduate and 500 graduate students. Otterbein remains committed to its relationship with the United Methodist Church and its spirit of inclusion, and welcomes people of all backgrounds to Otterbein’s Model Community. To learn more about Otterbein, visit www.otterbein.edu.